right now, most any "fashionista" who's worth her stylish salt is likely rocking a pair of (most likely black) strappy sky high platform stilettos (say that 12 times fast!). but, being i am not really amongst those ranks these days, i'm content to don something lower and decidedly more comfortable. 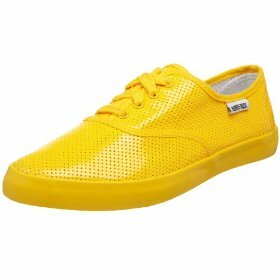 like these perforated monochromatic tennies by rubber duck. who seem to make some damn cute tennis shoes in general, wouldn't you know it?